When I was in first grade, a boy in my class--whose name I remember but will withhold out of courtesy--threw up. He was sitting at his desk and out it came, all over the floor with a splash. The teacher managed the episode calmly and professionally, directing all of us, except the boy, to go out into the hallway, with half the class on either side, and sit single-file along the brick wall. The uniformed janitor then arrived and we all knew why. We next saw our teacher walk the sick boy down the hall toward the office, presumably to his waiting mother. It seemed a long while until the janitor emerged again. He walked through the middle of our group, pushing his industrial-sized metal bucket and mop. For some reason, his walk out of that room and down the hall, is one of my most vivid memories of grade school. I watched him and wondered if he had pictures of anyone in his wallet. I wondered if he was lonely. I wondered if when he left school at the end of the day whether anyone listened to what he had to say. I remember wondering those three things about him. That janitor, his walk and those questions, have continued to nudge themselves into my mind from time to time in all the years since. This week I watched a documentary that caught my eye because it was about the inner lives of janitors. 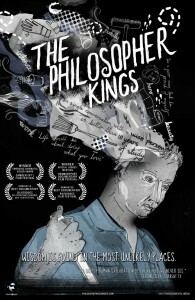 "The Philosopher Kings," released in 2009, films and interviews eight janitors who work in some of the most elite colleges and universities in America, including Stanford, Caltech, Princeton, Cornish College of the Arts, Cornell, University of Florida, Duke, and University of California Berkeley. It's a fascinating and moving documentary that reveals the challenges these eight have overcome in their lives, the dreams and goals they are pursuing, the sacrifices they make for others, what they learn from the institutions at which they work, and their significant inner wisdom. "Do you think the porter and the cook have no anecdotes, no experiences, no wonders for you? The walls of their minds are scrawled all over with thoughts. They shall one day bring a lantern and read the inscriptions."